All pictures must be delivered to the hall on Friday morning 12th July from 10.00am. and hung on the designated display board by the participating artist. The display boards will be supplied with artist’s name cards. The display boards are white pegboard approx 4’x4’ self-supporting, hanging clips are provided. Browsers are permitted within the display space allocated. It is the responsibility of the artist to replace sold pictures as necessary. It is requested that the Rotary price labels be used as supplied. All pictures sold may be removed from the exhibition on receipt of full payment in cash to the stewards. Offers of cheques by purchasers at the discretion of the stewards. Stewards are to provide receipts if requested. Tables will be available for the display of cards, the artists must ensure that all items are named and priced individually to assist the stewards in recording sales. Please note, it is necessary to restrict the display of cards to one basket per artist. All pictures must be priced and entered onto the artist’s entry form. Card numbers are also to be recorded. Preview night is Friday 12th July and commence at 7.00pm. Wine and light nibbles to be provided free. Participating artists are encouraged to invite friends and relatives. It would be appreciated if participating artists could assist by indicating on the rota to be supplied, what times and dates they are able to attend. Tea & coffee will not be available for visitors. Refreshments will be provided free for stewards. Payments for all sales are to be entered onto a daily sheet and balanced, signed by the steward and handed to a Rotary member at the close of each day. 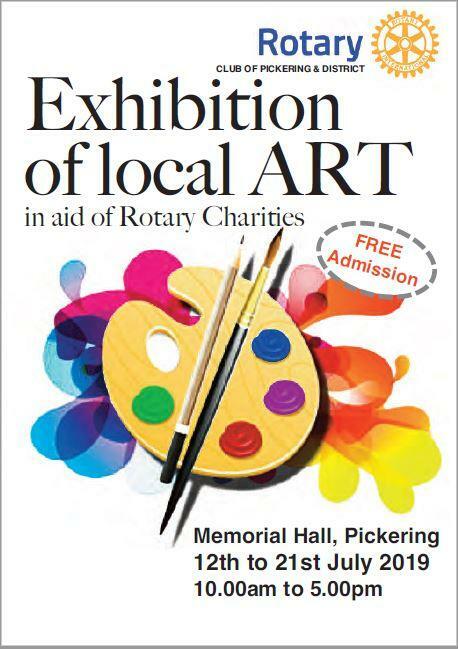 The Exhibition will close at 5.00pm on Sunday 21st July, Artists must collect their pictures etc. as soon as possible after the close as there is no facility to store any pictures unclaimed at this time, unless prior arrangements have been made.